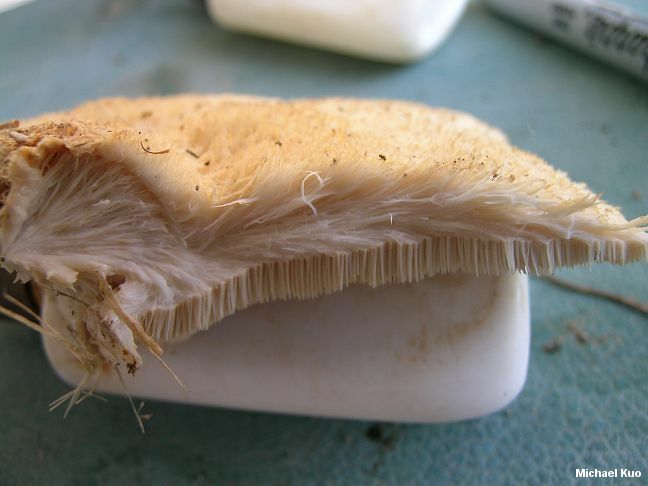 Though it is apparently not uncommon, this fascinating toothed mushroom is almost never treated in field guides. 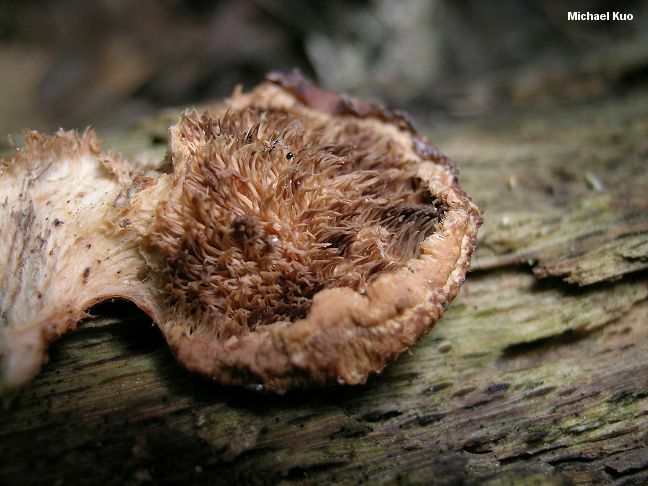 From above, its hairy, shell-shaped cap is reminiscent of a polypore (perhaps a species of Trametes)--but its underside features densely packed spines. Originally described from South Carolina, Climacodon pulcherrimus has since been documented throughout much of eastern North America, as well as Texas and New Mexico--and, globally, in many tropical and subtropical areas. 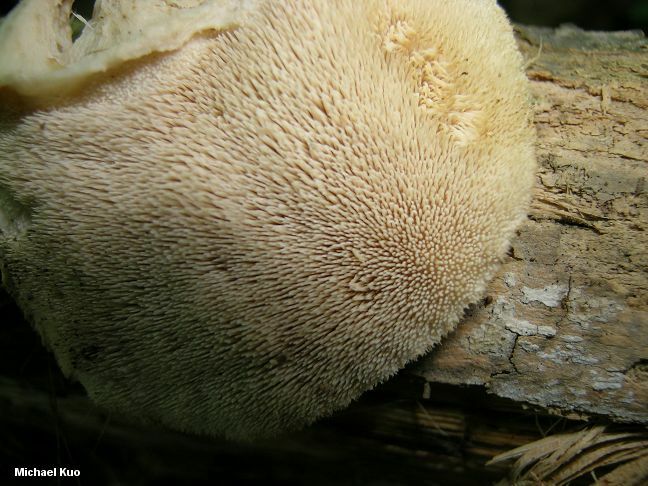 Distinctive features for Climacodon pulcherrimus include its whitish to pale tan or faintly orangish cap with a matted-hairy surface; its whitish teeth, which often darken or dry reddish brown; the pink to red reaction of the flesh to KOH; and microscopic features, including gorgeous double and multiple clamp connections in the hyphae of the flesh and cap surface. 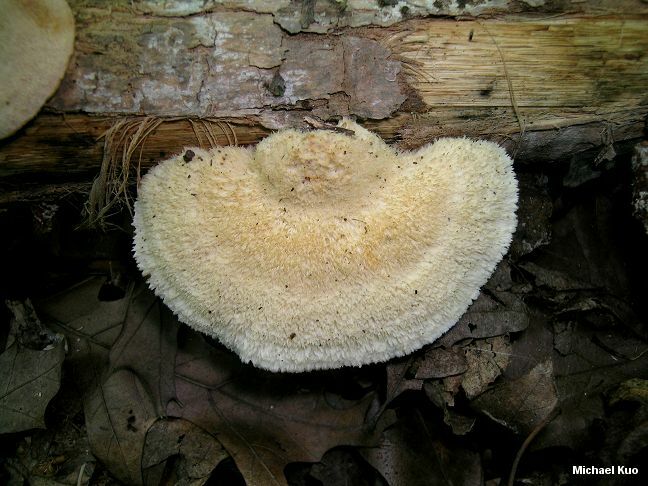 Steccherinum pulcherrimum, Creolophus pulcherrimus, and Donkia pulcherrima are synonyms--as is Hydnum kauffmanii, described by Peck (1907) from Michigan. Moreno and collaborators (2007) conclude that this species does not belong in Climacodon; other species in the genus have hymenial cystidia and lack multiple clamp connections--but the authors do not transfer Climacodon pulcherrimus to another genus. Ecology: Saprobic on the deadwood of hardwoods (and occasionally conifers); causing a white rot; growing alone, gregariously, or in shelving clusters; summer; documented from eastern North America, Texas, and New Mexico--but apparently more common in tropical and subtropical areas. Cap: 4-11 cm across; broadly convex to flat; fan-shaped or semicircular in outline; dry; matted-hairy to woolly; whitish to pale tan or faintly orangish. Undersurface: Composed of spines up to 8 mm long; fairly tightly packed; whitish to faintly orangish when fresh, but often darkening or drying to reddish brown; with age often sticking together. Flesh: White; unchanging when sliced; somewhat fibrous. Chemical Reactions: KOH pink to red on flesh and cap surface. Microscopic Features: Spores 4-6 x 1.5-3 µ; smooth; ellipsoid; inamyloid. Cystidia absent. 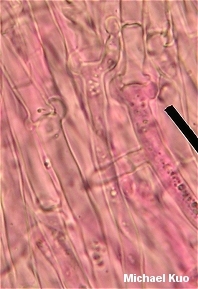 Hyphal system monomitic. Hyphae of the context and pileipellis frequently with 1-4 clamp connections at septa. REFERENCES: (Berkeley & Curtis, 1849) Nikolajeva, 1961. (Saccardo, 1888; Peck, 1907; Coker, 1919; Maas Geesteranus, 1971; Metzler & Metzler, 1992; Moreno et al., 2007.) Herb. Kuo 07300702, 08070901.